Students must understand the patterns created by counting numbers, starting from a given number, to a number 20 or less. 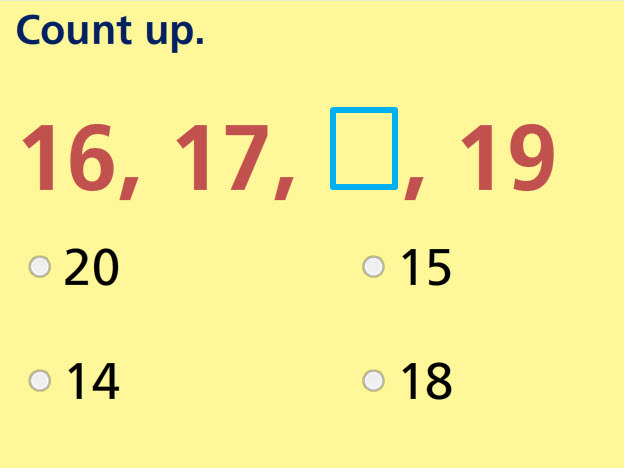 This test has several drag-and-drop questions and multiple choice questions that test a student's ability to count up to 20. They must count forward from a given number to a number up to 20. Return from this Count Forward- up to 20 Math Test to the Elementary Math Tests , Kindergarten Math Tests webpage, or to Math Tests.